The proposed sequence acquires three differently T1-weighted volumes. The first two volumes receive a saturation pre-pulse with different recovery time. The third volume is acquired without magnetization preparation and after a significant recovery time. Respiratory navigator gating and volume-interleaved acquisition are adopted to mitigate misregistration. The proposed sequence was validated through simulation, phantom experiments and in vivo experiments in 12 healthy adult subjects. In phantoms, good agreement on T1 measurement was achieved between the proposed sequence and the reference inversion recovery spin echo sequence (R2 = 0.99). Homogeneous 3D T1 maps were obtained from healthy adult subjects, with a T1 value of 1476 ± 53 ms and a coefficient of variation (CV) of 6.1 ± 1.4% over the whole left-ventricular myocardium. The averaged septal T1 was 1512 ± 60 ms with a CV of 2.1 ± 0.5%. Free-breathing 3D native T1 mapping at 3 T is feasible and may be applicable in myocardial assessment. The proposed 3D T1 mapping sequence is suitable for applications in which larger coverage is desired beyond that available with single-shot parametric mapping, or breath-holding is unfeasible. 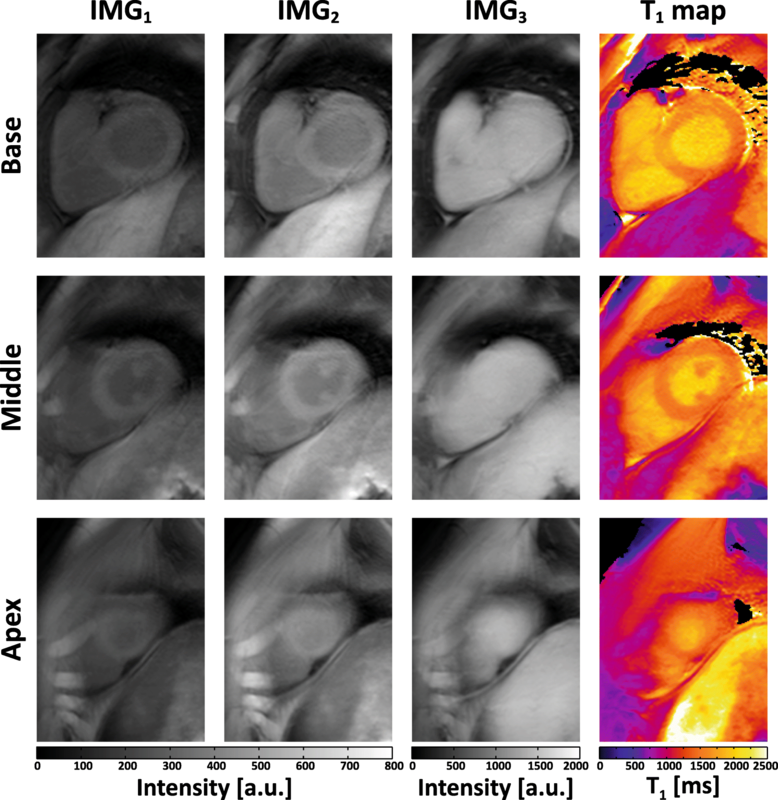 In cardiovascular magnetic resonance (CMR), myocardial T1 mapping provides a non-invasive tool for direct quantification of changes in tissue characterization. Native T1 is sensitive to tissue properties such as water content, fat, iron deposition and fibrosis [1, 2], and has been used to identify a broad variety of cardiomyopathies [3–6]. Additionally, measurement of myocardial T1 after infusion of T1-shortening contrast agents can be used to estimate extracellular volume (ECV) fraction. This is particularly valuable for detecting diffuse myocardial diseases to which conventional late gadolinium enhancement CMR is insensitive . Both native and post-contrast myocardial T1 mapping are important CMR techniques of ever increasing value in clinical diagnosis, prognosis and long-term follow-up of various cardiac diseases . T1 mapping techniques generally acquire multiple co-registered images with varying amounts of T1 relaxation and quantify T1 by fitting with exponential recovery models on a pixel-by-pixel basis. Current techniques, such as modified Look-Locker inversion recovery (MOLLI)  and saturation recovery single-shot acquisition SASHA , usually adopt a two-dimensional (2D) acquisition. These techniques differ in their T1 preparation strategies but most employ breath-hold and single-shot imaging. Breath-holding limits the total scan time available for acquisition of multiple single-shot images as typically one image is acquired per heartbeat. Thus, spatial resolution and coverage are also limited and the imaging is susceptible to lack of patient compliance. Furthermore, 2D imaging is intrinsically subject to through-plane motion artifact  and low signal-to-noise ratio (SNR) [10, 12] when using desired thinner slice, both of which can compromise the quality of parametric maps. The accuracy of the estimate of T1 may be further degraded by the misregistration of images, which can result from large acquisition window extending beyond diastasis along with poor breath-holding or heart rate variation . Motion correction methods have been developed to improve the map quality. However, these methods generally are limited to in-plane motion and require relatively complex processing [14, 15], and their validity has not been fully demonstrated. Three-dimensional (3D) acquisition has inherently higher SNR and allows more comprehensive left ventricular (LV) characterization due to its larger coverage, and higher potential in-plane and through-plane resolutions. However, 3D acquisition typically requires longer scan time due to simultaneous cardiac and respiratory motion compensation. This poses a challenge for accurate 3D myocardial T1 mapping, especially when measuring the relatively long native T1 at high magnetic fields. Several techniques for 3D T1 mapping have been proposed [16–22]. Among these techniques, some are designed for post-contrast myocardial T1 mapping [18, 20] and difficult to be extended for native myocardial T1 mapping. And some use inversion-recovery preparation, making the measured T1 sensitive to the variation of heart rate [21, 22]. Another technique using variable flip angle with 2D B1+ calibration showed fair quality of T1 map due to the variation of B1+ field across the left ventricle [16, 23]. At 1.5 T, a 3D implementation of SASHA has addressed these issues by using saturation preparation and acquiring an equilibrium volume . Compared with 2D SASHA , 3D SASHA achieves superior image and parametric map quality at the expense of increased scan time. 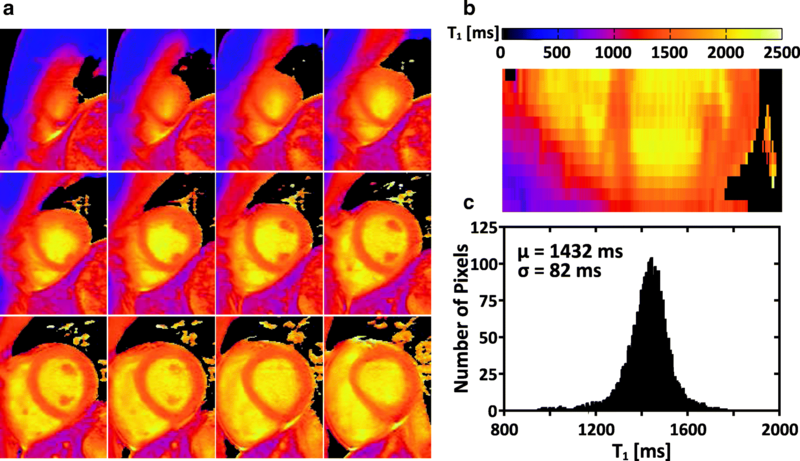 In this study, we propose a 3D free-breathing saturation-based T1 mapping sequence for myocardial tissue characterization at 3 T. In this sequence, the influence of field inhomogeneity at high field was mitigated by using radiofrequency-spoiled gradient echo (SPGR) sequence as readout, and the sensitivity to heart rate variation was reduced by adopting saturation prepulse. Additionally, a volume-interleaved acquisition fashion with respiratory navigation was designed to obtain an accurate measurement of the equilibrium magnetization thus ensuring accuracy of the T1 map. The proposed sequence was validated with simulations, phantom and in vivo experiments. All imaging studies were performed on a 3 T CMR System with multi-transmit capability (Achieva TX, Philips Healthcare, Best, Netherlands). Phantom studies used an 8-channel head coil and the in vivo studies used a 32-channel cardiac coil. The human study was approved by the local institutional review board. Written informed consent was obtained from all subjects. Numerical simulations, image processing, and statistical analysis were performed in MATLAB (MathWorks, Natick, Massachusetts, USA). The proposed 3D T1 mapping technique uses 3 differently T1-weighted volumes to generate the pixel-wise T1 maps. The sequence (Fig. 1) includes modules of saturation (SAT), respiratory navigator (NAV), fat suppression (FS) and image readout. The volumes are acquired using a multi-shot SPGR sequence in an interleaved fashion during diastole. The SAT-prepared volumes, IMG2 and IMG1, utilize different delay times (TSAT) corresponding to the maximal available delay time (TMAX) allowed by the system and half of TMAX (TMAX/2), respectively. IMG3 is acquired several heartbeats after the IMG2, without SAT preparation, to obtain the fully recovered equilibrium magnetization. Hence, a delay time of ≥6 s is desired for native T1 mapping (see the simulation below), and the number of T1 recovery heartbeats needed is calculated and updated in real time before each shot (Appendix). Despite heart rate fluctuation, the targeted minimum delay time is always achieved. SAT was implemented by using the WET (water suppression enhanced through T1 effects) technique . For in vivo studies, FS was applied right before the readout using spectral presaturation with inversion recovery (SPIR). Free-breathing acquisitions with respiratory motion compensation were achieved with a pencil-beam NAV on the dome of the right hemidiaphragm . The NAV data were acquired before the readout. Where A is the signal with full recovery of the longitudinal magnetization, S is the measured signal intensity, and TSAT is the saturation recovery duration. We assume that for a given voxel, the magnetization at the onset of imaging was a function of T1 and TSAT. The T1 recovery durations would affect the image signal intensities, and thus accuracy and precision of the T1 measured by the proposed sequence. These quantities are all dependent on heart rate. In this study, the following aspects were simulated: a) the available magnetization of IMG1 and IMG2 under various heart rates; b) the magnetization of IMG3 (i.e. the equilibrium volume) under different recovery time. Since the longitudinal magnetization is very small after the readout of IMG2 due to the use of SPGR, the initial signal intensity in this simulation was assumed to be zero; c) the relative error of T1 estimation induced by imperfect T1 recovery of IMG3. A full recovery of the equilibrium magnetization before the acquisition of IMG3 is desired for an accurate T1 estimation but it comes at the expense of scan efficiency. Due to the periodic nature of the cardiac cycle, the T1 recovery period for IMG3 can only be specified by an integer number of heartbeats. Variations in heart rate during T1 recovery eventually can result in degraded T1 estimation, as adopting an infinite or very long recovery time is impractical. To explore this heart rate dependency, Monte Carlo simulation was performed. The single simulation was repeated 10,000 times, with the heart rate varying with a prescribed mean value and a standard deviation (SD) of 5 bpm. The number of the idle heartbeats before imaging IMG3 was calculated with respect to the prescribed mean heart rate (Appendix) to achieve a T1 recovery duration ≥6 s.
In the above simulation, the magnetization as a function of the T1 was calculated using Bloch equations. The simulated T1 ranged from 500 ms to 1750 ms, and the heart rate from 40 bpm to 120 bpm. The efficiency of the SAT was assumed to be 100%. TMAX was calculated as 80% of the R-R interval. TSAT of IMG1 and IMG2 were set to TMAX/2 and TMAX. Phantom experiments were performed to validate the proposed sequence. Twelve gel phantoms, of which the T1 and T2 values span the possible myocardial relaxation times at 3 T (T1: 500–1800 ms, T2: 30–80 ms) , were prepared using different concentration of agarose (Sigma-Aldrich, Saint Louis, Missouri, USA) and gadopentetate dimeglumine (Gd-DTPA, Magnevist, Bayer Pharma AG, Germany). where S is the measured signal intensity, TINV is the T1 recovery duration after the inversion pulse, A, B and T1 are the unknowns. To explore the sensitivity of the proposed sequence to the heart rate, another nine scans of the proposed sequence were performed with the simulated heart rate changing from 40 bpm to 120 bpm at a step size of 10 bpm. TSAT of IMG1 and IMG2 were set to TMAX/2 and TMAX, which would change along with the heart rate. The targeted minimum recovery time for IMG3 was 6 s as well. where, A, η and T1 were the unknowns. Twelve human adult subjects (7 males, 30 ± 12 yrs) without a history of heart disease were recruited. Each subject was scanned with the proposed sequence and 2D SASHA. The imaging parameters for the proposed sequence were: electrocardiogram (ECG)-triggered multi-shot SPGR, partial echo factor 0.625, FOV 280 × 300 × 96 mm3, voxel size 1.5 × 1.5 × 16 mm3, which was reconstructed to 1.5 × 1.5 × 8 mm3, FA 18°, TR/TE 3.3/1.0 ms, respiratory navigator acceptance window 5 mm. The acquisition window was kept to 100–115 ms (i.e. 31–35 k-space lines was acquired per shot) to minimize the effect of cardiac motion and reduce partial volume averaging. TSAT for IMG1 and IMG2 were ~ 300 ms and ~ 600 ms, respectively, depending on the heart rate. No parallel imaging was used. Images were reconstructed using a dual-phase partial echo reconstruction method . 2D SASHA completed in a single breath-hold was performed at the mid-LV short-axis-view (SAX) level with the parameters: single-shot ECG-triggered balanced steady-state free precession (bSSFP) with 10 start-up echoes, FOV 280 × 300 × 10 mm3, voxel size 1.7 × 2.1 × 10 mm3, FA 35°, TR/TE 3.0/1.3 ms, sensitivity encoding (SENSE) acceleration rate 2, partial Fourier factor 0.875, TSAT ranging from 100 ms to 700 ms. Volumetric first-order B0 shimming and volumetric B1+ shimming were performed to compensate the field inhomogeneity before the T1 mapping scans . The shimming volume was manually defined carefully to include the heart only. In addition, the applicability of the proposed sequence for post-contrast T1 mapping was preliminarily studied on another two human subjects (males, age 46 ± 6 yrs). In this experiment, the proposed sequence used a targeted minimum recovery time of 3 s for IMG3, and was performed 15 min after injection of Gd-DTPA at 0.15 mmol/kg (Magnevist, Bayer Pharma AG, Germany). A center-aligned circular region of interest (ROI) was drawn on each phantom on the reference T1 maps and transferred onto the T1 maps obtained by the proposed sequence as well as the saturation efficiency map for calculating the mean and SD of T1 or η. The correlation between the T1 values from the proposed sequence and from IR-SE sequence was calculated by using linear regression. Bland-Altman analysis was also performed between the two sequences. The relative error (i.e. percentage estimation error relative to the T1 value from the IR-SE sequence) and the coefficient of variation (CV, the SD divided by the mean) were calculated for evaluation of the accuracy and precision of T1 measured by the proposed sequence. T1 maps from 2D SASHA were calculated using both two-parameter (2-Param) and three-parameter (3-Param) models . No registration among T1-weighted volumes or images was performed before T1 calculation. The LV was manually segmented slice by slice on the T1 maps from the proposed sequence by consensus between two observers. The long axis view was generated by reformatting the 3D dataset. To perform a comparison with 2D SASHA, the most position-matched slice was extracted from all the slices acquired by the proposed sequence. The mean and SD of the T1 values within the septal ROIs were calculated for both the proposed sequence and 2D SASHA. Then the T1 values of the two sequences were compared using a paired two-tailed Student’s t-test with significance level of 0.05. All SAX slices of the proposed sequence were evenly categorized into basal, mid-ventricular and apical slabs. Each slice in the base and middle slabs was divided into six segments, while each slice in the apex slab was divided into four segments, according to the American Heart Association (AHA) 17-segment model . The homogeneity and distribution of T1 were further evaluated on each segment by measuring the mean, SD and CV. The averaged results of all segments from all subjects were visualized with Bull’s-eye plots to assess the distribution of T1 throughout the LV. As expected, the heart rate had a strong influence on the available signal especially for long T1 species (Fig. 2). Figure 2a and b display the simulated available magnetization for volumes acquired with a TMAX/2 and a TMAX saturation-recovery duration, respectively. TMAX was shortened when the heart rate increases, leading to the reduction of the available signal. Figure 2c and d show the simulated magnetization of IMG3 and the resulting relative error of T1 over different recovery time. The magnetization of all simulated T1 species recovered to > 96% when the recovery duration was > 6 s. For a T1 value about 1550 ms, the magnetization recovery achieved about 98% and the corresponding relative error was < 4%. Figure 2e and f show the magnetization of IMG3 and the resulting T1 relative error in the Monte Carlo simulation. A relative error < 3% could be achieved for all T1 species (Fig. 2e). The typical T1 of healthy myocardium (1550 ms at 3 T)  could be measured with a relative error < 2.0% even at the highest simulated heart rate (120 bpm). The SD of the relative error was < 0.5% for all T1 species when the heart rate presented a 5 bpm fluctuation during the recovery period. The phantom T1 measured by the IR-SE sequence ranged between 524 ms and 1819 ms. Excellent correlation (R2 = 0.99) between the T1 values measured by the proposed sequence and the IR-SE sequence was obtained with a small residual and a regression slope of 0.95 (Fig. 3a). 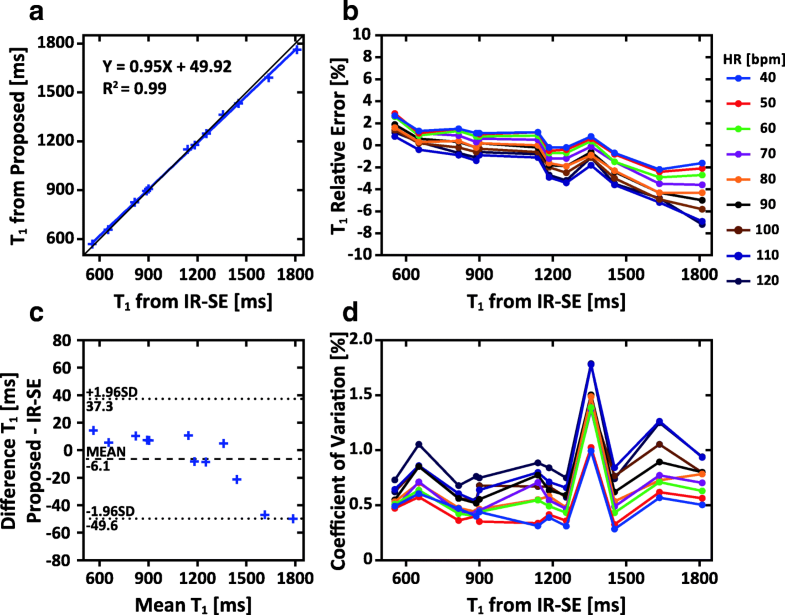 The bias in T1 between the proposed sequence and the IR-SE sequence was − 6.1 ms with the overall difference < 50 ms (Fig. 3c). The relative error of T1 measured by the proposed sequence was in the range of − 7.2 - 2.9% (− 0.9 ± 2.1%) (Fig. 3b), while the CV of T1 fluctuated in the range of 0.3–1.8% (0.7 ± 0.3%) (Fig. 3d), when the simulated heart rate ranged from 40 bpm to 120 bpm. The CV obtained from the proposed sequence was not significantly different from that of the IR-SE sequence, under a heart rate of 60 bpm (0.59% vs 0.52%, p = 0.35). The measured saturation efficiency of WET pulse was 0.999 ± 0.012 over all phantoms (Additional file 1: Figure S2). The proposed sequence and 2D SASHA were successfully completed on all subjects. The respiratory gating efficiency was between 22 and 60% (39 ± 11%). The averaged scan time was 6.0 ± 1.1 min including the respiratory gating efficiency. The gating efficiency of navigator for IMG1 and IMG2 is provided in Additional file 1: Table S1. The averaged T1 recovery time for IMG3 was between 7.0 s and 8.0 s (7.5 ± 0.4 s). Characteristics of the healthy subjects’, HR, recovery time of IMG3, mean navigator efficiency and scan time are summarized in Table 1. All subjects were included in the quantitative analysis. Figure 4 shows the raw weighted images acquired by the proposed sequence and the corresponding T1 maps from three slabs (i.e. base, middle, apex) of a subject. To illustrate the blurring effect that may present in the proposed sequence due to multi-shot 3D acquisition, images of the subject with the most distinct blurring are shown in Fig. 5. Figure 6 shows representative whole heart 3D T1 maps obtained by the proposed sequence. As can be seen, the myocardium T1 was homogeneously distributed over the whole LV. The myocardium T1 over the whole LV from all subjects was 1476 ± 53 ms, and the CV was 6.1 ± 1.4%. Figure 7 demonstrates the SAX T1 maps obtained by the proposed sequence and 2D SASHA with both 2-Param and 3-Param fitting on four subjects. Figure 8 shows the bull’s-eye and box plots of the myocardium T1 based on the AHA 17-segment model. The measured myocardium T1 of the apex, middle and base slab were: 1436 ± 71 ms, 1475 ± 52 ms and 1500 ± 49 ms, respectively. Statistically significant statistical difference was found between every two slabs (p < 0.01 for all paired t-tests). Figure 9 shows the comparison of the septal T1 and CV between 2D SASHA and the proposed sequence. The septal T1 from the proposed sequence with 2-Param fit was 1512 ± 60 ms, which was comparable with that from the 2-Param fit SASHA (1490 ± 65 ms) (p = 0.33) but lower than that from the 3-Param fit SASHA (1575 ± 59 ms) (p = 0.005). The proposed sequence showed much lower CV (2.1 ± 0.5%) than 2D SASHA (3.9 ± 1.2% for 2-Param fit, p = 0.0007; and 5.5 ± 0.9% for 3-Param fit, p = 0.0001). The native T1 values from the proposed sequence and 2D SASHA on the whole heart myocardium, septum and blood pool are summarized in Table 2. In the additional experiments with contrast injection, homogeneous myocardial T1 maps were obtained by the proposed sequence, as shown in Fig. 10 in which a dedicated colormap was used . The measured septal T1 at the middle heart slab of the two volunteers were 712 ± 28 ms and 731 ± 19 ms, respectively, while the blood T1 were 438 ± 12 ms and 450 ± 15 ms, respectively. Both the post-contrast myocardium and blood T1 values conform to the range reported previously . 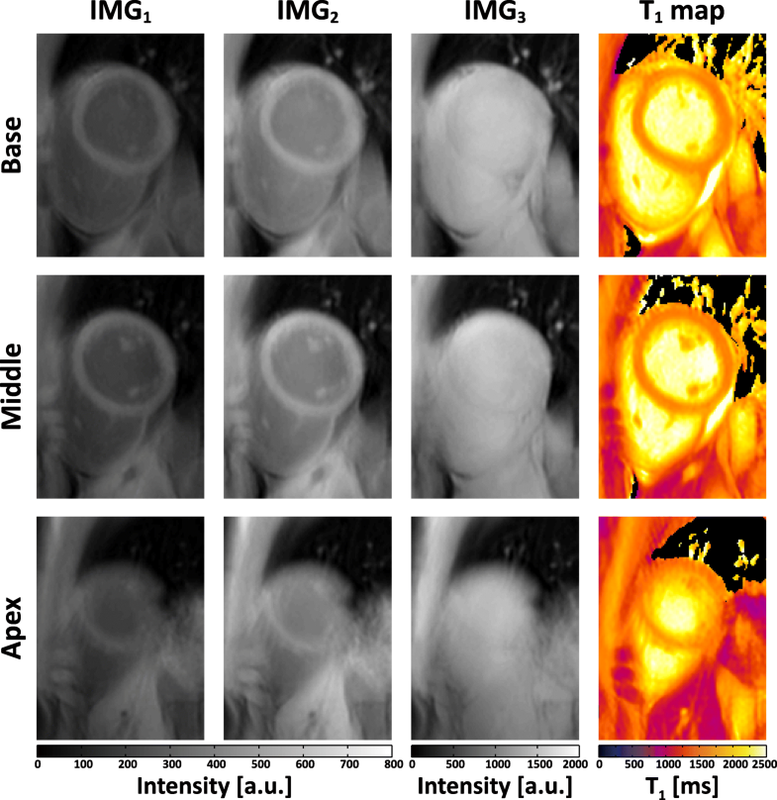 In this study, we demonstrate a 3D free-breathing T1 mapping sequence for myocardial T1 measurement at 3 T. Whole-heart pixel-wise T1 maps were obtained from three co-registered volumes with different T1 weightings. The phantom results show that the proposed sequence achieved good accuracy in T1 measurement as compared to the reference IR-SE sequence. This technique also features heart rate insensitivity. Whole-heart T1 maps with low CV were obtained in the in vivo experiments. As far as we know, this is the first study that implements a 3D saturation-based sequence for native myocardial T1 mapping at 3 T. It is much more challenging to achieve accurate and precise heart T1 measurement at high fields such as 3 T, given the prolonged myocardial T1 and increased field inhomogeneity . In this study, several tools were used to address these challenges: 1) A composite SAT pulse [24, 30] that was relatively insensitive to the B1+ field inhomogeneity was used; 2) A dual-source parallel radiofrequency transmission was used to improve the B1+ field homogeneity ; 3) SPGR instead of bSSFP was used to avoid the banding artifacts caused by the B0 field inhomogeneity; 4) A partial echo readout was used to reduce the susceptibility-induced signal loss; and 5) Both B1+ and B0 shimming were carefully carried out before the acquisition. In this study, the respiratory motion was compensated by using the respiratory NAV. Alternatively, breath-holding that is commonly used in 2D cardiac parametric mapping is also feasible for the proposed sequence, although multiple breathholds are required. However, the multiple breathholds fashion would suffer from inter-breath-hold shifting or variability in the breath-hold position, which can lead to motion artifacts and distortion of the T1 maps . The motion compensation with respiratory NAV is generally less affected by these effects. The other advantage of the respiratory NAV as compared to bread-holding is that it does not impose limits on the image resolution and coverage [22, 31]. Moreover, free-breathing scans are also more acceptable for elder people and cardiac patients who have difficulty in breath-holding. Another adaption of the proposed sequence for 3D imaging is that multi-shot data acquisition was employed. In general, multi-shot acquisition allows reduction of the acquisition window, thus minimizing blurring due to cardiac motion and partial volume averaging, an important factor for increasing the sensitivity of T1 mapping to disease processes with heterogeneous distribution . More importantly, in this study, interleaved multi-shot acquisition of all T1-weighted volumes was used. This led to intrinsic co-registrations of the acquired volumes, and the physiological changes during the scan could be evenly spread over all volumes so that no extra motion correction is needed before the pixel-wise fitting [18, 20, 31]. It has been recommended to acquire a non-SAT image and multiple measurements for the saturation-recovery based T1 mapping sequence [32, 33]. This presents a challenge for 3D acquisitions as the only way to acquire data for the non-SAT image is to allow for complete or near-complete relaxation spanning multiple heartbeats. To achieve appropriate relaxation, the prescribed number of idle heartbeats was adapted per shot of the non-SAT volume based on the real-time heart rate to ensure a recovery time of ≥6 s. Though the actual recovery time varied among shots due to the rejection of data by respiratory gating, the minimal 6 s recovery time was always achieved and ensured at least 98% recovery for normal myocardial (~T1 1550 ms) at 3 T [26, 34]. On average, the recovery time (7.5 ± 0.4 s) was longer than the prescribed value in vivo and yielded > 99% recovery ultimately resulting in a high SNR anchor measurement and stable T1 fitting with low CV. The proposed sequence was, by design, robust against the heart rate variability. 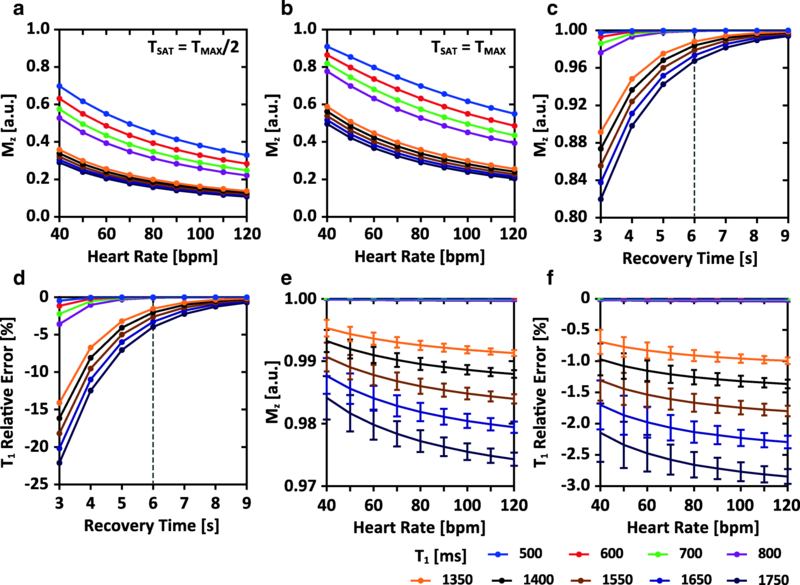 By means of SAT and the acquisition of an image representing the equilibrium magnetization, an accurate sampling of the T1 recovery curve was achieved despite the variation in the duration of the cardiac cycle. In the numerical simulations and phantom experiments (Fig. 2f), with 100% gating efficiency, each shot of IMG3 was immediately acquired after the prescribed heartbeats, resulting in elevated relative error in the estimate of T1 when the heart rate increased and the recovery time decreased (i.e. smaller rounding off error with respect to 6 s according to Eq. A1). For the in vivo experiments, the number of the idle heartbeats was updated in real-time to ensure a recovery time of ≥6 s and may be increased due to the rejection of data by respiratory gating. Hence, the simulations and phantom experiments represent an upper bound on errors of the T1 estimation as they did not include the additional adaptations by respiratory gating in vivo. We used 2D SASHA as a reference in vivo and used a flip angle of 35° due to the constraints of local energy deposition at 3 T . The reduced flip angle decreases the SNR of the weighted images in comparison with the original 2D SASHA that used 70° at 1.5 T, which in turn decreases the precision of T1 estimates . In this study, the in-plane cardiac motion was not corrected before pixel-by-pixel fitting. This could have influenced the estimated T1 values. Though non-rigid motion correction methods are available for 2D T1 mapping, these algorithms have shown poorer results for saturation-recovery T1 mapping methods due to low SNR and contrast in the weighted images . Nevertheless, the septal T1 obtained by 2D SASHA with both 2-Param (1490 ms) and 3-Param (1575 ms) fit in this study was reasonable, as compared to the values reported in previous studies [26, 34, 35]. In the proposed sequence, FS was applied to suppress the subcutaneous fat, which would degrade the image quality severely as shown in Additional file 1: Figure S3. Previous studies have shown that the measured myocardium T1 has complicated relationship with the regional fat fraction and the imaging parameters [36, 37]. For the myocardial T1 measured by the proposed sequence, the application of FS may have two impacts. One is that nulling the fat signal would inevitably affect the resultant T1 of myocardium, which contains both water and fat . Another is that the magnetization of water in the myocardium may be disturbed by the imperfect fat-selective RF pulse of the SPIR technique due to the field inhomogeneity. Since most of the conventional T1 mapping sequences are commonly performed without using FS, the interpretation of the difference of the T1 measured by the proposed sequence to that of other T1 mapping techniques should be careful. The measured septal T1 from the proposed sequence (1512 ms) was lower than that from 3-Param fit 2D SASHA (1575 ms) which has been demonstrated to have high accuracy on T1 estimation . This discrepancy may be explained by the following factors. First, as shown by the results of the simulation, the proposed sequence has a relative error of about − 1% for T1 of 1550 ms even when a 7.5 s recovery time was achieved in vivo. The simulation also showed that this relative error could be further reduced by using a longer recovery time for the equilibrium volume, at the expense of a prolonged scan time. Second, although our data shows that the saturation efficiency of the WET pulse was high on phantoms (Additional file 1: Figure S2), this may be less true in vivo due to the increased B1+ inhomogeneity . In this study, a 2-Param model was used for T1 calculation for the proposed sequence, without taking the saturation efficiency into account. This effect may also contribute to the underestimation of T1. A better design of the SAT pulse to further reduce the influence of the inhomogeneity of B1+ field  or acquiring more T1-weighted volumes to enable a 3-Param fitting could improve the accuracy of the T1 estimation by the proposed sequence. Last, the application of FS could also contribute to the difference in T1 measurement when compared with conventional T1 mapping methods without using FS, as discussed above. The proposed sequence has high precision on T1 measurement as demonstrated by both the phantom and in vivo experiments, although limited number of image volumes were acquired. On the phantom the CV of T1 obtained by the proposed sequence was not statistically different from that of the reference IR-SE sequence, while in vivo the CV obtained by the proposed sequence was much lower than that of both the 2-Param fit and 3-Param fit 2D SASHA (Fig. 9). These results suggested that the T1 measurement by the proposed sequence has high precision. The precision of T1 mapping technique is dependent on several factors, including T1, SNR, saturation delay, the signal model and the number of measurements [13, 32, 33]. Considering that the proposed sequence in this study acquire only three images for parameter fitting, we think its high precision should be attributed to the high image SNR resulting from 3D imaging and 2-parameter model fitting. In fact, the image SNR of the proposed sequence was generally higher than that of 2D SASHA, as shown in Additional file 1: Figure S4. Similar to the previous studies [39, 40], fluctuations of T1 among the AHA segments were observed (Fig. 8). Due to the difference in factors like field strength, number of slices, slice thickness, fitting model and sample size between the studies, at the moment it is difficult to determine whether an improvement on depicting the AHA pattern can be achieved by the proposed technique [16, 17, 19, 26]. On the other hand, the observed decreased T1 from the inferior to the lateral myocardium may be caused by the well-known susceptibility artifacts and the field inhomogeneity at the heart-liver-lung interface . 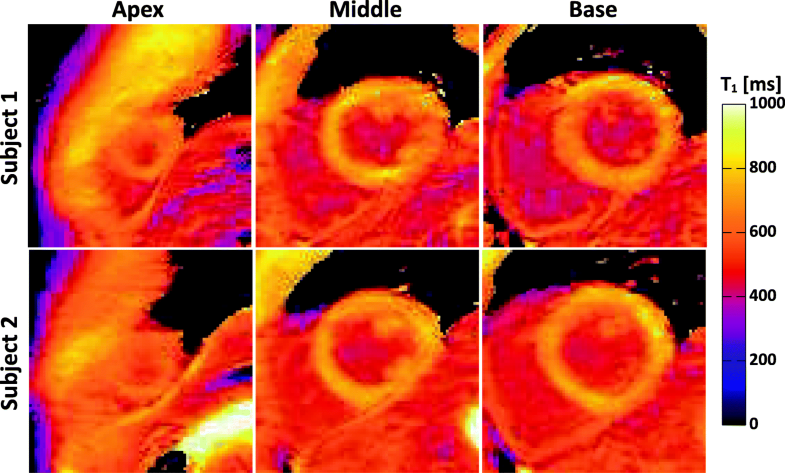 The proposed sequence can be used to achieve post-contrast myocardial T1 mapping with higher efficiency than that for native myocardial T1 mapping. Generally, the myocardial T1 would be reduced to ~ 800 ms at 3 T after 15 min of the contrast injection. The simulation results showed that for such a T1 value, a recovery time of 3 s was sufficient for achieving an equivalent magnetization recovery to the pre-contrast scan during the acquisition of the equilibrium volume. Besides, the simulation results (Fig. 2a and b) also demonstrate that the available signal for IMG1 and IMG2 in the post-contrast T1 mapping will be much higher than that in native T1 mapping, which should lead to increased precision. In the present study, homogeneous post-contrast T1 maps with the same voxel size as the native T1 maps were obtained within 3 min. Performing whole-heart myocardial T1 map with and without contrast together could be used to character the regional distribution of ECV and to observe regional heterogeneity. Though implementing the most comparable sequence 3D SASHA and performing an experimental comparison of the proposed sequence with it is beyond the scope of this work, some information can be given based on a theoretical comparison. The proposed sequence has a similar scheme of signal preparation to 3D SASHA as both rely on SAT . 3D SASHA closely matches 2D SASHA and acquires 9 differently-weighted volumes using bSSFP and has been demonstrated solely at 1.5 T. The equilibrium volume is acquired separately from the other T1-weighted volumes with a recovery time of 3 heartbeats. Image resolution of 1.4 × 1.4 × 8 mm3 was achieved using SENSE with a 2-fold acceleration in an average scan time of 12 min. The two sequences use different strategies to balance the performance (e.g., accuracy and precision of T1) and time efficiency (e.g., the number of the T1 weighted images, the use of paralleling imaging) though imaging at 3 T requires additional tradeoffs. At 3 T, energy deposition and B0 and B1+ fields inhomogeneity preclude the use of 3D bSSFP . Therefore, the proposed sequence used 3D SPGR which is insensitive to field variation. The equilibrium volume was given twice the recovery time for 3D SASHA at the expense of reduced number of weighted volumes. Note that 3D SASHA does benefit from the residual magnetization at the end of a bSSFP readout which is significantly higher than that at the conclusion of the SGPR readout, increasing the effective T1 recovery. Additionally, the prolonged myocardial T1 at 3 T required a longer recovery time to achieve the equilibrium than that at 1.5 T. Though both techniques acquired the volumes in an interleaved manner [18, 20], 3D SASHA acquired the equilibrium volume separately to better use the residual magnetization of the previous readout. Potential misregistration between the equilibrium volume and the others could happen due to the drift of respiratory state of subject. Clearly, more T1-weighted images could improve the precision of T1 estimation and parallel imaging, as used in 3D SASHA, could also be applied to the proposed sequence and the increase in efficiency could be used to increase the number of the weighted volumes. However, the effects of parallel imaging on parametric maps (e.g. decrease in SNR, spatially varying noise) are unclear and we opted for full sampling of the data. A more detailed analysis is needed to accurately compare the two techniques and to determine the most efficient sampling strategy. There are several limitations of this study. First, the long scan time as in our current protocol (~ 6 min) may present a barrier to its clinical application. To reduce the scan time, standard parallel imaging or the current state-of-the-art acceleration strategies such as compressed sensing could be adopted , especially given the amount of structural similarity shared among the weighted volumes. The 6 s recovery period needed for an accurate sampling of the equilibrium magnetization is the most time-consuming component in the current approach. This recovery period can be further optimized by a trading off among the precision, fitting models and scan time. Second, interleaved acquisition provides co-registered T1-weighted volumes. However, it should be noted that when the volumes are acquired in an interleaved manner, the acquisition time between the first and last k-space segment of each volume is increased, therefore increasing the potential motion artifact that is difficult to predict and correct. Nevertheless, non-interleaved acquisitions would also suffer given that the volumes could represent different physiological states, leading to poor fitting and inaccurate T1 estimation. 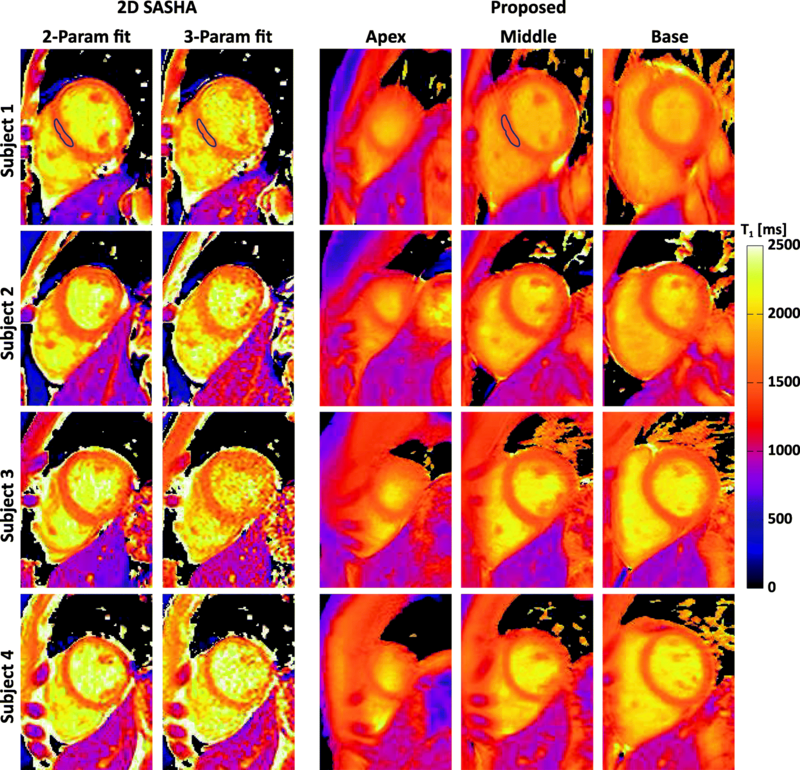 We present a 3D free-breathing sequence for myocardial T1 mapping at 3 T. The proposed sequence achieves whole heart coverage with low myocardium T1 CV. Saturation pulse and long T1 recovery duration for the equilibrium acquisition are used to decrease the heart rate dependency. The proposed 3D myocardial T1 mapping is feasible for in vivo study at 3 T.
This work was supported by the National Key R&D Program of China Funding 2016YFC0104700, 2017YFC0108700. RG performed sequence implementation, validation, data analysis and manuscript preparation. ZC contributed to sequence design, data analysis and manuscript preparation. YW contributed to manuscript revision. DAH contributed to sequence design and manuscript revision. JL contributed to study design and manuscript revision. HD contributed to study design, validation, data interpretation and manuscript preparation. All authors critically revised the paper and have read and approved the final manuscript. The study was approved by Institutional Review Board of School of Medicine, Tsinghua University. Inform consent was obtained from all participants. where Ttarget is the targeted minimum T1 recovery time (e.g. 6 s in this study), Ttrigger is the time from the detected R wave to the readout (see Fig. 1). HR represents the heart rates. The square bracket represents the operation of rounding up to an integer. Note that because of this rounding up operation, the true recovery time is always larger than the targeted minimum T1 recovery time.